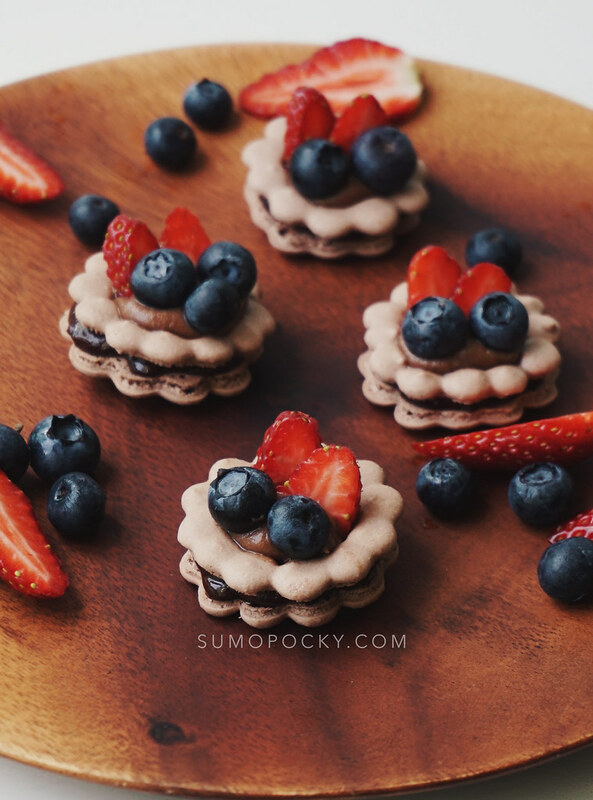 These Macaron Fruit Tarts are made with a macaron "tart", filled with dark chocolate ganache and chocolate yuzu custard, and topped with fresh berries. 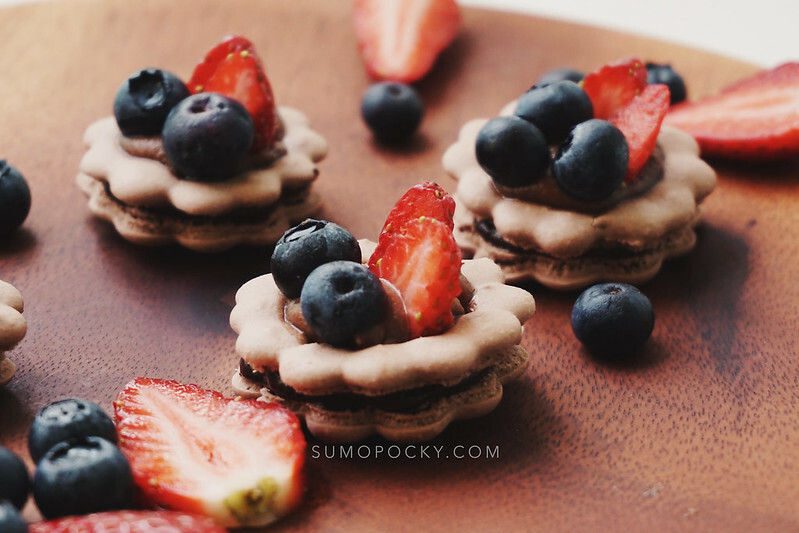 I was in the mood for something rustic for a change, and wondered if it's possible to do it with an elegant dessert like macarons. 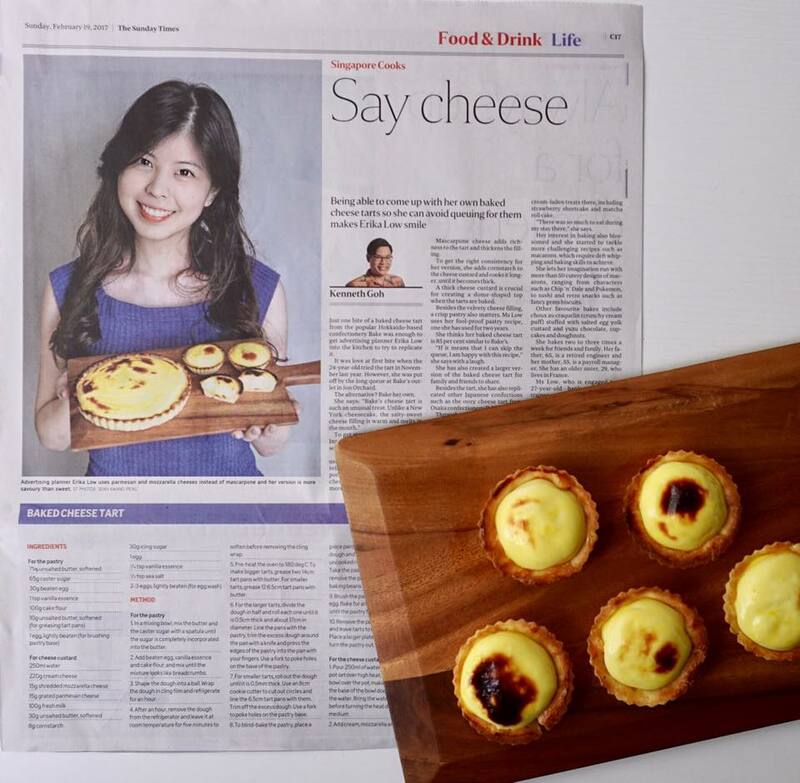 Thus, I was inspired to make the "tart" with macaron shells. 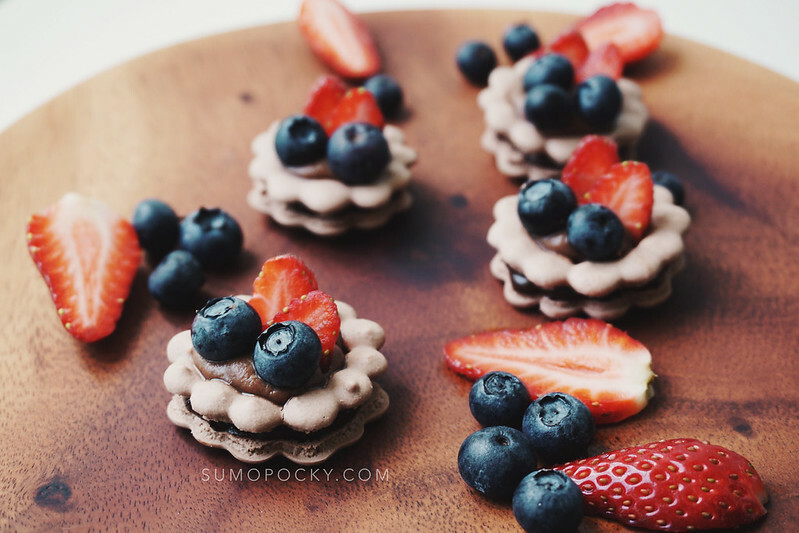 The texture of this dessert is very unique - the crispy macaron shell on the outside gives way to a chewy macaron shell inside, followed by the an explosion of chocolate flavour and tanginess of the yuzu and berries. They taste best when served immediately! When left for too long, the custard would make the macaron shells soggy. 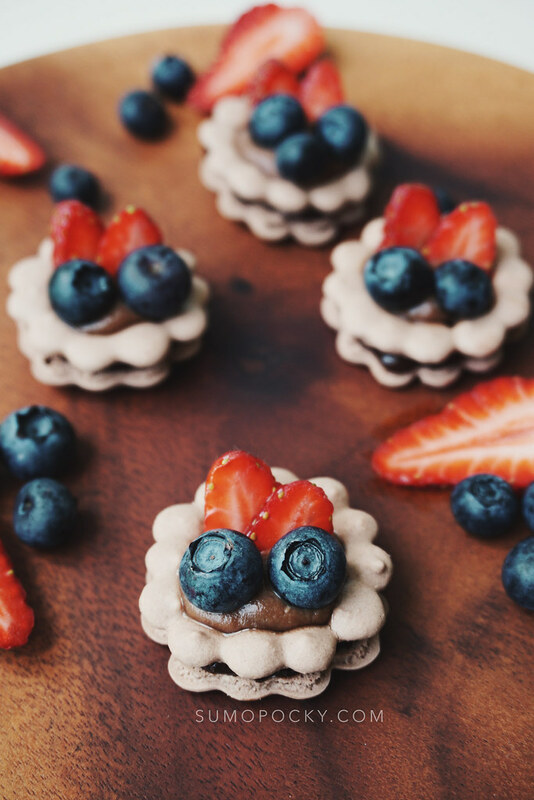 If you are making these macaron fruit tarts in advance, then skip the custard and fill the entire shell with chocolate ganache or a macaron filling of your choice. 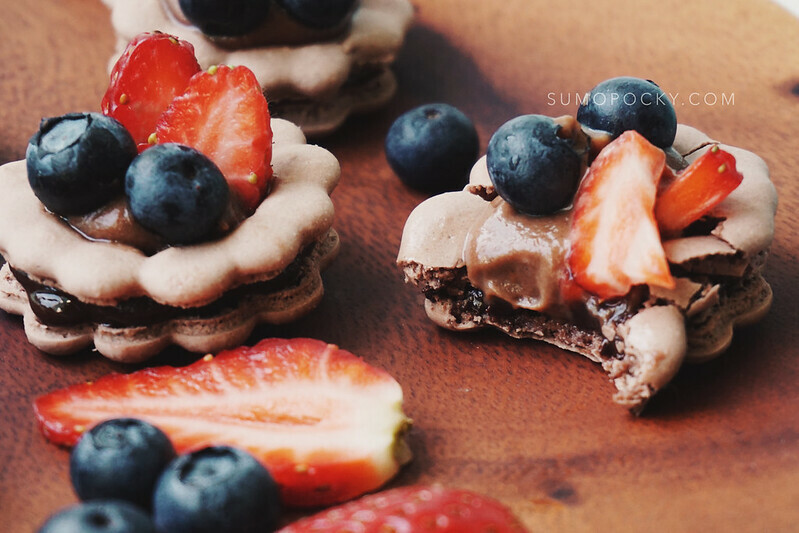 Will definitely be experimenting with more flavour variations of these macaron tarts in the future! They are such a delight to make, and certainly elevates the basic fruit tart to the next level. 1. Make the meringue. In a bowl, beat the egg whites on low speed using an electric mixer until it is white and frothy (approximately 1 minute). Add 1/4 of the sugar. When the first addition of sugar has completely dissolved (approximately 1 minute later), increase the mixer speed to medium and gradually add the remaining sugar. Continue to beat until stiff peaks form. 3. Begin macaronage. Using a spatula, start the macaronage process by folding and lightly scraping the top of the batter. Continue until the wet and dry ingredients just start to combine. Sift in cocoa powder and continue to macaronage until you get a molten-like mixture and drips down like a ribbon when lifted. Transfer some to a piping bag with a small round tip (about 0.5cm in diameter). 4. Pipe out batter onto baking tray lined with parchment paper. Please refer to video above for demonstration. 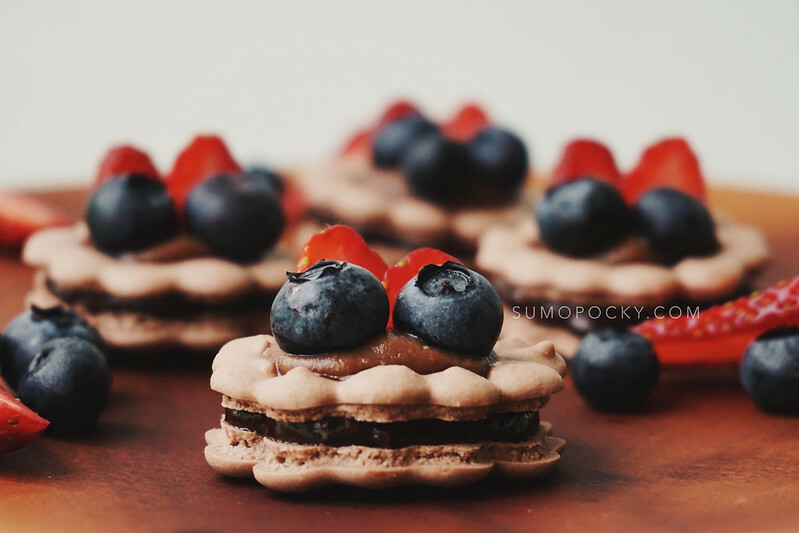 TIP: Make equal numbers of top "tart" and bottom "tart" macaron shells. 7. Let the shells dry in a non-humid place. You should be able to touch it gently with the tip of your finger without it sticking. 8. 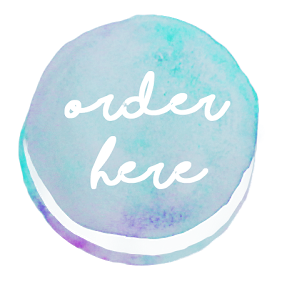 Bake in a preheated oven at 150°C for approximately 10 - 13 minutes. 9. Let shells cool before filling. 1. Bring heavy cream to a simmer. 2. Pour heavy cream over chocolate. Let it sit for 1 minute and stir with a whisk till all the chocolate has melted. 4. Transfer the filling to a piping bag. 1. Pipe a ring of dark chocolate ganache on the base "tart" shell. Cover with the top shell. 2. Fill the centre with the chocolate yuzu custard. 3. Top with strawberries and blueberries. Whoa. Such pretty things! I stumbled here because I was finding a recipe for cheese tart. So grateful for google!